This is a very simple WebSocket based IRC WebClient/Server. This WebClient is a regular Swift package and can be imported in other Swift servers! 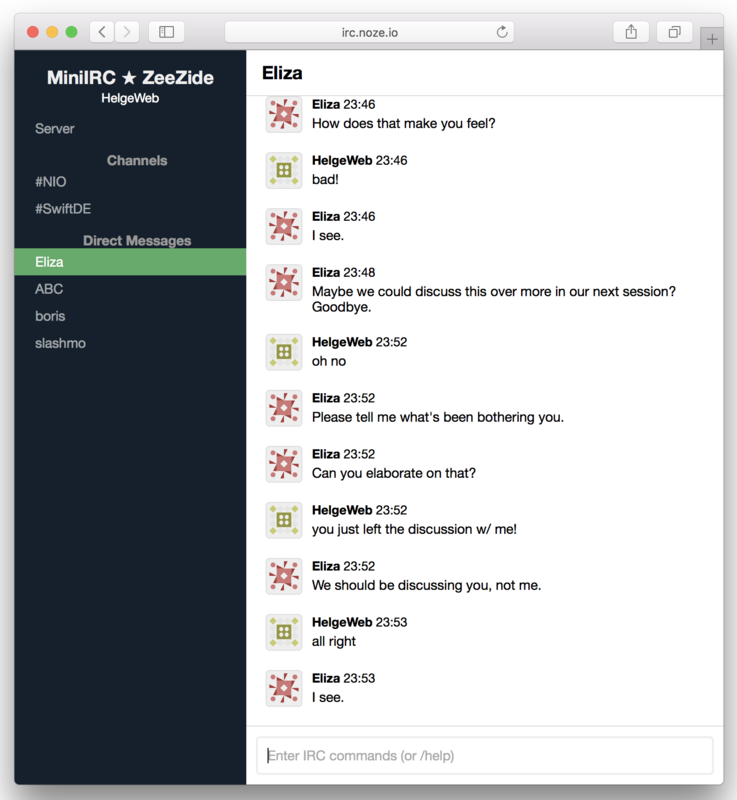 Sometimes a live demo installation is running on http://irc.noze.io/. We probably have to shut it down once abuse starts to take place :-) If it doesn't run and you want to play with it, just install it locally, it is a matter of minutes using MiniIRCd. Server as an HTTP endpoint for the WebSocket connection. If the JS webapp creates a WebSocket connection, it'll contact the HTTP server, which will then upgrade the HTTP connection to the WebSocket protocol. The client app is located in Sources/IRCWebClient/WebApp. Check the Configuration object for the supported configuration options. externalHost/port - the address the browser is using to connect to the HTTP server. Often but not necessarily the same like 1. The IRC client lib was moved to a standalone package to not spam the protocol implementation.